So where do we go from here? The only actor large enough to restore confidence in the US market is the US government. The current policy of quantitative easing by the Fed is a move in the right direction but it does not, as yet, go nearly far enough. It is time for a greatly increased role for monetary policy through direct intervention of central banks in world stock markets to prevent bubbles and crashes. Central banks control interest rates by buying and selling securities on the open market. A logical extension of this idea is to pick an indexed basket of securities: one candidate in the US might be the S&P 500, and to control its price by buying and selling blocks of shares on the open market. Even the credible announcement that a policy of this kind was being considered should be enough to boost the markets and restore consumer and investor confidence in the real economy. basket of stocks. This policy would still allow poorly run firms to fail but it would not allow all firms to fail at the same time. I believe that James Tobin suggested something similar many years ago. Congressional leaders have named my long-time friend Doug Elmendorf to be the new head of the Congressional Budget Office. Congratulations to Doug, and kudos to Congress for the fine choice! The (first-ever!) American Economic Association humor session will take place Saturday Jan 3rd from 8-9 pm in the Hilton San Francisco (333 O'Farrell Street), rooms Golden Gate 1 and 2. The event is free and open to the public; Preston McAfee (CalTech) will be presiding, with speakers including Peter Orazem (Iowa State), Rob Oxoby (Univ of Calgary), and Yoram Bauman. There will also be an award for the funniest paper of 2008. Tyler Cowen finds one in 1998. Larry describes the first inklings of a proposal. Permanent tax cuts offer a much better option. The incoming chairman of the Council of Economic Advisers, Christina Romer, has estimated that the macroeconomic benefits of tax cuts can be two to three times larger than common estimates of the benefits related to spending increases. The relative advantage of tax cuts over spending is even clearer when the recession is centered on the household balance sheet. Some relatively minor changes, like making the current 15 percent tax rate on dividends and capital gains permanent, would not only help household cash flow, but also put a floor under equity prices much as their introduction did in 2003. This would help protect against further wealth destruction and balance sheet deterioration. But the centerpiece of any tax cut should be employment taxes: in particular, a permanent halving of the current 12.4 percent Social Security payroll tax on the first $106,800 of wages, split evenly between workers and employers. The direct revenue effect of that would be a bit under $400 billion per year, roughly in line with the present quantitative needs of the economy. It also meets our three tests of effective stimulus. Second, the funds would be extremely timely, with the benefits hitting the economy with the first paycheck after the plan was implemented. Third, by lowering the taxation of labor, the plan would help produce a higher-employment recovery than would otherwise be the case. Since the tax cut should be permanent to have maximum effect, the biggest challenge would be how to make up for the lost revenue once the macroeconomic need for fiscal stimulus had passed. In the short run, effective fiscal stimulus requires that government revenue drop, thereby enriching the private sector, and with the Treasury making the Social Security trust fund whole by way of intergovernmental bookkeeping. Longer term, however, spending cuts or a new source of revenue would be needed. Given the agenda of the incoming administration, the best source of such funds would be a greenhouse emissions tax. It would be a much more efficient way of achieving the desired environmental objectives of the administration than any of the regulatory or "cap and trade" ideas now being considered. Such programs have failed in Europe since they are so easily gamed. Unlike regulations or cap and trade, moreover, an emissions tax can be phased in and calibrated as macroeconomic conditions permitted, specifically as the unemployment rate declined. Update: More Pigou Club endorsements here and here. First time e-mailer, long time reader of the blog. I'm currently a Sophomore at University of Wisconsin-Madison planning to major in Economics having just completed the intermediate Econ courses there. During my spare time, I love to do what most other students probably would consider crazy, and just read economics books no matter what the viewpoint of the author is. I had my first Economics courses in high school taught by a Friedman disciple, my Intermediate Micro by another very Chicago school economist, and my intermediate Macro taught by (from what I was able to judge) a Neo-Keynesian. Every time I've gone into office hours with these professors, I've always come away with the attitude of "I can definitely see their point". I have never felt like they forced their beliefs on me, which is a good thing. I fully admit that I'm a young foolish college student, so whenever these professors or teachers talk to me, I'm usually pretty open to whatever they say. I've gotten into some very spirited debates with my Macro professor, but it's always been completely respectful and very thought-provoking. So I guess my question, although loaded, is this: What advice would you give to a college undergrad being exposed to so many different ideologies at the same time? I can go from being told by my ECON 301 (Intermediate Micro) professor that we should, for example, let the banks fail and let the market do it's work, and I can see his point. I can then go talk to my ECON 302 (Intermediate Macro) professor and he will say that it's ludicrous to not do SOMETHING regarding the financial crisis, and I can also see his point. I know there is never a set in stone answer for what economic should dictate,but would you say that the way you see Economics today was slowly cemented as you progressed in your studies? Thanks again, love your blog, happy holidays. 1. The current economic environment is a particularly hard time to learn economics. There are a lot of topics about which economists agree, but the diagnosis and best remedy for the current economic downturn are not among them. It is therefore no surprise that your econ profs express disparate views about the appropriate policy in the current environment. Don't read too much into this fact. I bet there are many other topics about which these economists would come to similar conclusions. Ask them about rent control, or international trade, or Pigovian taxes, for instance, if you want to find broad areas of agreement. 2. You are lucky that you have professors with different viewpoints. Your job, as a budding economist, is to learn from all of them. Ideally, at the end of the day, you should be able to understand and appreciate (although not necessarily agree with) each point of view. You should try to construct in your mind a debate between your Friedmanite professor and your Keynesian professor. What points would each raise, and how would the other respond? 3. As you come to grips with these various points of view, you will be in a better position to judge which you find most cogent. But don't expect to reach unequivocal positions easily. In my view, it is best to consider all knowledge as tentative. The best scholars maintain an open-mindedness and humility about even their own core beliefs. Excessive conviction is often a sign of insufficient thought, which in turn may be derived from a certain pig-headedness. Intellectual maturity comes when you can maintain the right balance between informed belief and honest skepticism. You sound like you are on the right path. Quantitative easing from Marketplace on Vimeo. Bob says monetary policy is still the first line of defense. Case A: uses the money to give a lump-sum payment (such as a tax rebate) to Joe Average, who chooses to spend his free time sitting at home watching Mork and Mindy reruns. Case B: uses the money to hire Joe to sit at home and watch Mork and Mindy reruns. Case C: uses the money to hire Joe to sit at home and watch Family Feud reruns, which Joe does not enjoy quite as much as Mork and Mindy. In all the cases, Joe will spend some of the money he gets on consumer goods and services, leading to a Keynesian multiplier. But those knock-on effects are the same in the three cases, so we can put those aside for now. Let's begin by comparing cases A and B. These two scenarios are identical in terms of final allocations and economic welfare. Joe is doing the same thing, and all the money flows are the same. But note that the macroeconomic statistics would be different. In Case B, Joe is employed producing a government service. If we used standard data to compare Case B with Case A, Case B would show more hours worked and a higher Gross Domestic Product. Now look at Case C. It has the same employment and GDP as Case B, but welfare is strictly lower. Joe is, after all, less happy watching Family Feud. Comparing Case C with Case A, therefore, we see greater employment, greater GDP, and lower welfare. Usually, GDP is a reasonable proxy for economic well-being, so more is better, but that is not true in this example. Part of the problem here is that GDP includes government purchases at cost. If the government hires people to produce stuff that is worthless, that stuff is included in GDP just as much as if the government buys something valuable. When calculating GDP, the national income accountants do not pass judgment on the social utility of government spending. Anyone concerned with economic well-being has to go beyond thinking about GDP. The moral of the story: If the government spends a fiscal stimulus package on goods and services without much public value (as in Case C), it could well stimulate the economy as measured by macroeconomic aggregates but leave the participants in the economy worse off (compared with a feasible alternative, Case A). Avoiding this trap requires that the government spend taxpayers dollars only those items that pass a strict cost-benefit test. That is hard to do quickly. Willy-nilly spending is a good way to stimulate the economy only if the outcome is judged by the wrong metric. As I draft my extensive Christmas list of unneeded items, my conscience calls me to add a favorite charity or two, which my family members could consider gifting in my name. Still, I know that not all charities are as efficient (or proficient) at their giving. For example, I remember reading (in Easterly's White Man's Burden, I think) that there have been many less-than-perfect results in distributing free bed-nets, arguing that they are optimally delivered subsidized rather than free. While I think bed-nets are a great avenue to donate to the world's poor, there are many different organizations where someone can purchase them, and I, for one, have no idea who is the best at it. I hope my request isn't too vague. Happy Holidays! Sure, I would be happy to make some recommendations. If readers want to donate for nets, one good organization I have supported in the past is here. TamTam provides nets free at clinics. Personally I think this approach makes sense because charging dramatically reduces use, free distribution can help encourage mothers to come to antenatal clinics, and, like vaccines, insecticide treated nets can help interfere with disease transmission creating positive externalities. For some evidence on the first issue, see this paper. One of the best buys out there is treating kids for worms. Two billion people have intestinal worms worldwide, including 400 million school-children. The medicine costs pennies per dose. Because the medicine is cheap and safe, but diagnosis is expensive, the World Health Organization recommends mass treatment in schools in areas of high prevalence, which can keep total costs per treated child to $0.25. Treatment not only has medical benefits but helps kids stay in school longer. Ted Miguel and I estimate benefit/cost ratios of more than twenty to one in Kenya. Hoyt Bleakley estimates that the Rockefeller Foundation's deworming campaign in the US South in the early twentieth century added two years to average education in affected areas and that worms accounted for 20% of the income gap between the US North and South at the time. Based on the evidence, several economists, including Esther Duflo, Kristin Forbes,and me, are involved in, and have donated to, a new group called Deworm the World. Information is available here. There is a donate button which explains how people can give. Deworm the World will soon be a tax exempt 501(c)3 organization, but not before either the holidays or the end of the tax year. If readers are from the US and want a tax deduction, they can support Save the Children's school health efforts by clicking on the link above and going to the donate box, or if they want to more directly help Deworm the World, they can donate to Innovations for Poverty Action by going to this link and noting that the donation is for Deworm the World in the comment box. Thanks to Chris for asking the question and to Michael for answering it. I hope this information helps direct some charitable giving in the right direction. I read your blog on a daily basis and I've noted your skepticism about the monstrous bailout package being considered by the incoming Obama administration. In reading all of the econblogs I can find, I'm struck by the lack of practical knowledge both there and within the circle of advisers Obama has assembled. budgets they have. They can't just add a zero at the end of each contract and be done with it. Stop looking at models and equations and theoretical constructs for a while and look at the practical considerations of the stimulus package. I've been doing this sort of thing for quite a while and I'm convinced it's doomed from the start. If they feel the need to blast a trillion dollars into confetti, then tax cuts would make the most sense. Even if the public used the money to pay down debt, that would be a good thing as it would transfer the debt burden from the consumer to the government making the consumer feel a little bit like spending again. The Association of Zoos and Aquariums (AZA) today called for shovel-ready zoo and aquarium infrastructure projects to be eligible for Federal stimulus funding....Many zoos have their roots in the Great Depression, when the Federal Work Projects Administration (WPA) helped build many zoos across America. Of course, this lobbying is part of the political process. Whether the AZA gets the money it wants for new zoos will be up to the new administration and Congress. I am sure that the Obama transition team is now carefully evaluating many hundreds of billions of dollars of proposed spending projects and will, over the next few weeks, determine precisely which of these pass a cost-benefit test. Obama advisers, including Christina Romer and Lawrence Summers, have been contacting economists from across the political spectrum in search of advice as they assemble a spending plan that would meet Obama's goal of preserving or creating 2.5 million jobs over two years....Only one outside economist contacted by Obama aides, Harvard's Greg Mankiw, who served on President Bush's Council of Economic Advisers, voiced skepticism about the need for an economic stimulus, transition officials said. Skepticism, rather than unequivocal opposition, is the right word. When contacted, I said the same things I have been saying on this blog: that monetary policy is not out of ammunition, and that tax cuts are potentially more potent than spending increases. I could have added that a spending-based stimulus to address the current short-term crisis might lead to a long-term increase in the size of government, but I doubted that concern would sway Team Obama. In general, I think economists need a large dose of humility when evaluating alternative proposals to deal with the current downturn, as there is still a lot we do not understand. I am sure I am not the only person in the economics profession skeptical of spending increases to stimulate the economy. See, for example, GMU economist Tyler Cowen. If the new administration wanted to find more skeptics of stimulus spending among professional economists, I could have come up with some possible candidates for them, but the Obama economists probably already know who those likely skeptics would be. By the way, House Republican leader John Boehner is compiling "a list of credentialed American economists who would like to add their voices to the list of stimulus spending skeptics." Click here to learn more. President-elect Barack Obama says the government has been "asleep at the switch" when it comes to overseeing the nation's financial system. He says Americans are "feeling frustrated that there's not a lot of adult supervision." You might appreciate the irony that Citigroup's primary federal regulator is Timothy Geithner. Recent news articles suggest that the Treasury Department is considering a plan to offer a 4.5% mortgage for home buyers for a period of time. Let's hope it does. It would help arrest the decline in house prices that is at the base of the ongoing financial crisis and recession. Encouraging everyone to make highly leveraged bets on housing was patently a mistake. Housing policies of the past also erred by aiming at amorphous, often contradictory objectives, including higher homeownership rates, more affordable housing units and, most recently, higher prices. Those policies then mistakenly applied the same policy medicine to every housing market, whether housing was abundant and inexpensive or scarce and unaffordable. The problems of old-style housing policy are well illustrated by the unwise proposal being considered to provide subsidized loans to home buyers at 4.5 percent interest. The Obama team's chatter about creating jobs in alternative renewable energies is hollow to say the least. Here's why: Any serious attempt to reduce carbon emissions must ultimately rely on a very large tax on the use of fossil fuels. And a very large tax on fossil fuels as an add-on to the taxes we already pay would drive the economy deeper into the ground -- with or without alternative renewable energy jobs. The only real solution is Al Gore's proposal to offset a carbon tax dollar-for-dollar with either an income or payroll tax reduction. If a carbon tax increase were offset dollar-for-dollar with an income tax rate cut, I for one would strongly support the policy. The economy would benefit because the progressive income tax does far more damage than a carbon tax would, and we'd use less oil. It's a win-win situation. Yet this perspective appears to be totally outside the Obama team's ken. Becerra said, "My concern was how much weight this position [U.S. Trade Representative] would have and I came to the conclusion that it would not be priority No. 1, and perhaps, not even priority No. 2 or 3." This was what worried me last March. Update: A reader suggests that I misinterpreted this story. If trade had been a priority, the reader suggests, it would have a renegotiation of trade agreements and a retreat from free trade. So putting trade on a back burner is then good news. Perhaps. But I suppose this means that Joe Biden will not be following in the footsteps of Al Gore, who as veep defended the Bush-negotiated NAFTA on nationwide TV. Recall that there are still several pending free trade agreements, including those with Colombia and South Korea. The incoming adminstration would boost business confidence, and maybe investment spending as well, if it made a clear commitment to get these treaties passed and to continue pushing for more open markets. The above figure (reprinted from my favorite textbook) shows government revenue as a percent of GDP. The most noteworthy feature of these data is the substantial growth of government from 1929 to 1945. It is easy to understand why the size of government grew so much during this period: The nation was responding to the crises of the Great Depression and, especially, World War II. But what is noteworthy is that while these crises were transitory, the increase in the scope of government was permanent. This historical episode is one reason why advocates of limited government are rightly worried about the fiscal stimulus package that the incoming administration is going to propose. Rahm Emanuel, the new White House chief of staff, is reported to have said, "You don't ever want to let a crisis go to waste: It's an opportunity to do important things that you would otherwise avoid." It is not entirely clear what he meant by this. But one interpretation is that he wants to use a temporary crisis as a pretense to engineer a permanent increase in the size of government. Here is one question reporters should focus on when evaluating the proposed plan: Five or ten years from now, when the economy is presumably at some normal level of employment and growth, what will the federal budget look like, as evaluated by the budget deficit and tax revenue as a share of GDP? Update: Russ Roberts emails me that "Robert Higgs's Crisis and Leviathan is devoted to the relationship between the size of government and crisis." Thanks, Russ, for the reference. With the Fed having cut its target interest rate today to a range of zero to 1/4 percent, many people will be asking whether the central bank has run out of ammunition. A good question. Obviously, the next step is not going to be further cuts in the federal funds rate. But there is still more the Fed can do. The phrase "for some time" is aimed at managing expectations in order to keep long-term interest rates down. The next step for the Fed is to drop the "price stability" rhetoric. The Fed has never been truly committed to stable prices. After all, inflation during the Volcker-Greenspan era averaged about 2 to 3 percent. The Fed could have lowered inflation to zero if it had wanted. Now that zero, or even below zero, is a possibility, the Fed needs to convince people that we are going back to the normal inflation rate of 2 to 3 percent. The Committee recognizes that moderate inflation would be desirable under the present circumstances. In particular, the overall level of prices a decade hence should be about 30 percent higher than the price level today. The committee anticipates keeping the stance of monetary policy sufficiently accomodative to achieve that degree of inflation over the coming decade. That is, even if the Fed cannot reduce nominal interest rates, it can reduce real interest rates by committing to a modest amount of inflation. Some would view this as a radical change in monetary policy. In some ways, it would be. Given how weak the economy is, however, a bit of radicalism may be called for. I am more comfortable having the Fed commit itself to modest inflation than having the federal government commit itself to a trillion dollars of new spending. The more we can rely on monetary rather than fiscal policy to return the economy to full employment and sustainable growth, the better off future generations of taxpayers will be. The abandonment of "price stability" would be the modern equivalent of Roosevelt's abandonment of the gold standard. Of all the things that Roosevelt did to get the economy out of the Depression, jettisoning the gold standard was the most successful. Today, monetary policy is fettered not by gold but by fear of inflation. Perhaps it is time is get over that fear, at least for a while. As Jim Tobin said in an earlier era, there are worse things than inflation, and we have them. Update: A reader points out to me that Paul Krugman seems miffed that I failed to cite his contribution to the large literature on expectations management by the central bank. Sorry, Paul. I actually do like Paul's paper on the topic quite a lot, and I cite it in my intermediate macro text when I discuss the liquidity trap (see footnote 5 on page 325 of the 6th edition). It is funny. For academics, it is an occupational hazard to feel that your work is insufficiently cited. I had always assumed that the feeling would go away after winning a Nobel prize. I guess I was wrong. "Somehow we have to figure out how to boost the price of gasoline to the levels in Europe," Mr. Chu, who directs the Lawrence Berkeley National Laboratory in California, said in an interview with The Wall Street Journal in September. But Mr. Obama has dismissed the idea of boosting the federal gasoline tax, a move energy experts say could be the single most effective step to promote alternative energies and temper demand. N.B. : NEC Director Larry Summers is also a club member in good standing. Will the energy secretary and NEC director manage to convince the president-elect to change his mind? Stay tuned. How about me? I'm 6' 2"
Suppose you are trying to get from one end A of a terminal to the other end B. (For simplicity, assume the terminal is a one-dimensional line segment.) Some portions of the terminal have moving walkways (in both directions); other portions do not. Your walking speed is a constant v, but while on a walkway, it is boosted by the speed u of the walkway for a net speed of v+u. (Obviously, given a choice, one would only take those walkways that are going in the direction one wishes to travel in.) Your objective is to get from A to B in the shortest time possible. 1. Suppose you need to pause for some period of time, say to tie your shoe. Is it more efficient to do so while on a walkway, or off the walkway? Assume the period of time required is the same in both cases. 2. Suppose you have a limited amount of energy available to run and increase your speed to a higher quantity v' (or v'+u, if you are on a walkway). Is it more efficient to run while on a walkway, or off the walkway? Assume that the energy expenditure is the same in both cases. I won't even pretend that I could solve the third problem. Addendum: Steve Landsburg has previously examined these issues with more of a focus on the economics. If you read this blog, it is a good bet that you have some interest in economics. Most likely, you would be delighted if members of Congress were a bit more committed to applying economic principles to public policy. If so, I have the candidate for you. Charles Wheelan, author of the book Naked Economics, is running for Congress in the 5th District of Illinois. This is Rahm Emanuel's seat, which will open up when he joins the Obama Administration. Click here to get a taste of how Wheelan thinks. Click here to learn more about his campaign. Click here to contribute. As I post this, Wheelan has raised $22,322 from 47 supporters. I am sure some readers of this blog will want to join the effort. Harvard's Robert Lawrence joins the Pigou Club. Another economist for Chapter 11. A key issue facing the new Obama administration is to what extent the economic stimulus should take the form of spending increases versus tax reduction. One way to think about the issue is the size of the fiscal policy multipliers. The multipliers measure bang for the buck--the amount of short-run GDP expansion one gets from a dollar of spending hikes or tax cuts. By contrast, recent research by Christina Romer and David Romer looks at tax changes and concludes that the tax multiplier is about three: A dollar of tax cuts raises GDP by about three dollars. The puzzle is that, taken together, these findings are inconsistent with the conventional Keynesian model. According to that model, taught even in my favorite textbook, spending multipliers necessarily exceed tax multipliers. How can these empirical results be reconciled? One hypothesis is that that compared with spending increases, tax cuts produce a bigger boost in investment demand. This might work through changing relative prices in a direction favorable to capital investment--a mechanism absent in the textbook Keynesian model. Suppose, for example, that tax cuts are not lump-sum but instead take the form of cuts in payroll taxes (as suggested by Bils and Klenow). This tax cut would reduce the cost of labor and, if labor and capital are complements, increase the demand for capital goods. Thus, the tax cut stimulates demand not only by increasing disposable income and consumption spending (the textbook Keynesian channel) but also by incentivizing more investment spending. A similar result might obtain if the tax cut included, say, an investment tax credit. This hypothesized channel seems broadly consistent with the empirical findings of Blanchard and Perotti, Mountford and Uhlig, Alesina and Ardagna, and Alesina, Ardagna, Perotti, and Schiantarelli. The results of all these authors suggest you need to go beyond the standard Keynesian model to understand the short-run effects of fiscal policy. My advice to Team Obama: Do not be intellectually bound by the textbook Keynesian model. Be prepared to recognize that the world is vastly more complicated than the one we describe in ec 10. In particular, empirical studies that do not impose the restrictions of Keynesian theory suggest that you might get more bang for the buck with tax cuts than spending hikes. There has been a lot of talk lately about a new "car czar" who would oversee the auto industry under the proposed rescue plan. It seems a strange word choice, as the the word "czar" come from pre-revolution Russia, before the principles of central planning overtook the nation. A more accurate title might be car commissar. Tom explains why it is hard to do. Andy Harless, a former student of mine at Harvard, has a blog. Tom Brokaw invites Barack Obama to join the Pigou Club. Mr. Obama demurs. But notice the emphasis on the phrase "right now." Maybe he will join at a later date. The Club is willing to keep the invitation open. Mr. Obama's emphasis on weatherization and alternative lighting reminds me of President Carter's admonition to turn down the thermostat and wear cardigan sweaters. Maybe it works as a short-term sound bite, but it is not much of a long-term policy. Addendum: The Washington Post confirms its membership. Alan Blinder is Pro and John Taylor is Con. These papers are not new, but they have renewed relevance in the current environment. A literature in macroeconomics, in which I have participated from time to time, looks to the costs of price adjustment--that is, menu costs--as the reason for the gradual adjustment of prices to economic shocks. A blog reader alerts me to one restaurant's solution to the problem: an inflation surcharge added at the end of bill. Economists Bob Hall and Susan Woodward opine over at their new blog. STOCKHOLM, Sweden (AP) — Nobel economics prize winner Paul Krugman said Sunday that the beleaguered U.S. auto industry will likely disappear. "It will do so because of the geographical forces that me and my colleagues have discussed," the Princeton University professor and New York Times columnist told reporters in Stockholm. "It is no longer sustained by the current economy." Krugman won the 10 million kronor (US$1.4 million) Nobel Memorial Prize in economics for his work on international trade patterns. Some of his research on economic geography seeks to explain why production resources are concentrated in certain locations. Speaking to reporters three days ahead of the Nobel Prize ceremony, Krugman said plans by U.S. lawmakers to bail out the Big Three automakers were a short-term solution, resulting from a "lack of willingness to accept the failure of a large industry in the midst of an economic crisis." Facing massive job losses, the White House and congressional Democrats are negotiating a deal to provide about $15 billion in loans to prevent the weakened U.S. auto industry from collapsing. Update: Paul says he was misreported. Source. Click on the graphic to enlarge. Each block in this histogram represents one year of stock returns, using data since 1825. The most recent observation, based on 2008 returns to date, is the dark block in the far left tail. The figure gives a good sense of how historically extraordinary this year's bad news has been. That's the increase from last year in the price of a particular basket of consumer goods: twelve drummers drumming, eleven pipers piping, ten lords a-leaping, nine ladies dancing, eight maids a-milking, seven swans a-swimming, six geese a-laying, five golden rings, four calling birds, three French hens, two turtle doves, and a partridge in a pear tree. Note that this index, like the CPI, assumes a fixed basket and therefore does not allow the consumer to take advantage of changes in relative prices. If you could substitute and, for example, buy fewer turtle doves and more French hens, the hit to the consumer's well being would be smaller. But it would wreak havoc on the song. University of Chicago economist Casey Mulligan is worried about the incentives that the Treasury and Fed are creating. Here is the more academic version of the argument. In a previous post, I suggested a reason why older, rather than newer on-the-run, TIPS were closer to true measures of real interest rates. 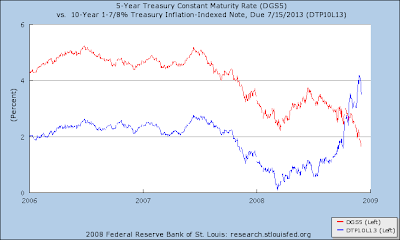 Here (in blue) is the yield on such a bond issue, compared with the yield on a nominal bond (in red). As of the most recent data, the yield on a TIPS bond that was issued about five years ago and will mature in about 5 years is 173 basis points (1.73 percentage points) above the yield on a five-year nominal bond. Perhaps this difference in yield has to do with a particularly large liquidity premia for TIPS. And perhaps it is due to the changing risk premia associated with the two bonds. (See this post.) But to the extent the yield spread reflects inflation expectations, it suggests deflation is an increasingly likely possibility. I think it is time for the Fed to consider in earnest taking up some form of inflation targeting. (Or, better yet, price level targeting.) Initially, inflation targeting was discussed as a policy aimed at reassuring markets that we won't have too much inflation. Right now, we need it to reassure markets that we'll have enough. Addendum from the Tax Policy Blog: "The video quoted how much in additional tax the farmer in the story, Charles Hanehan, would pay under this proposed tax. And he made a ridiculous comparison to the bailouts that certain companies are getting right now, which is irrelevant. But since he brought up handouts to certain companies, I did a little digging on EWG's Farm Subsidy Database and found that Hanehan Family Dairy received $561,695 in subsidies from 1996-2006. You can't make this stuff up." Good news for Harvard: Raj Chetty, the star public finance economist now at UC Berkeley, has accepted an offer to join the faculty of our economics department. This morning I was interviewed on CNBC's Squawk Box. The event was recorded for C-SPAN, but I don't know when it will be aired. From Harvard economist Ken Rogoff. I just received the goods news that Harvard's Fed Challenge Team today won the national championship at the Federal Reserve Board in DC. Congrats to all involved! Even staying within the AD-AS model, it seems possible to argue the opposite point of view. Imagine you are a manager of a firm considering a long-term investment project. The President has just announced a policy to encourage your workers to form a cartel. How does that influence your decision to proceed with the project? Very likely, it deters you. Investment spending, however, is part of aggregate demand (in fact, one of the most volatile components). Thus, the policy could shift the AD curve, as well as the AS curve, in a contractionary direction. As a general matter, the state of aggregate demand depends on an amorphous variable called confidence. Anything that threatens to screw up AS in the long run most likely reduces confidence and AD in the short run. The textbook separation of AD and AS is useful for focusing discussion in the undergraduate classroom, but events in the real world are rarely so clean. Ralph Nader joins the Pigou Club. David Leonhardt thinks behavioral economists can save us. Oliver Hart and Luigi Zingales want more companies to go bankrupt. Larry interviews one of my favorite economists. (1) Like previous stimulus efforts, it has the standard demand side impact (same as cutting checks). But it also stimulates employment directly by reducing the tax penalties for working and for hiring workers. Related, it works under all business cycle models (even including those obeying Ricardian Equivalence). (2) It targets domestic production better than sending out checks (or a sales tax cut). (3) It targets lower income households, due to the cap on social security taxes. These households may respond more in both their consumption and employment decisions. Now, it does not target the unemployed. But, in combination with extension of unemployment benefits, those with labor force attachment are still covered. In fact, it helps limit the damaging effects of extending the duration of unemployment benefits in terms of distorting reentry and job creation decisions. Intriguing idea. In light of my post from yesterday on fiscal policy puzzles, I am especially attracted to the goal of robustness: we should try to find a stimulus plan that works under a variety of alternative business cycle models. Thanks to Jim Hamilton for the graph. According to U.S. Treasury data, the five-year real interest rate from the TIPS market on 11/28/08 was 4.17 percent. Yesterday, it was 2.03 percent. That is a huge change over only a few days. What happened? It appears to be, in large measure, a figment of data construction. Real yields on Treasury TIPS (Treasury Inflation Protected Securities) at "constant maturity" are interpolated by the U.S. Treasury from Treasury's daily real yield curve. These real market yields are calculated from composites of secondary market quotations obtained by the Federal Reserve Bank of New York. Starting 12/01/2008, the TIPS yield curve will use on-the-run TIPS as knot points rather than all securities under 20 years. Why such a large difference between on-the-run (new) vs off-the-run (old) bonds, and why did the issue only arise now? I am not sure, and the Treasury website does not explain, but here is a guess. TIPS offer asymmetric inflation-protection. If the price level rises, your principal rises as well. But if the price level goes down, you get your initial nominal principal back. (Don't believe me? Click here.) A new TIPS bond is great when there is risk of deflation. It is a real bond if prices go up, but more like a nominal bond if prices go down. Heads you win, tails you win also. An older TIPS bond, however, is not as attractive. A lot of price inflation is already built into the adjusted principal. All of that inflation has to be undone by subsequent deflation before the nominal floor on the principal kicks in. As a result, when there is risk of deflation, the older bond has to offer a higher yield to compete with a newer one. In other words, after a period of inflation, an older TIPS is closer to a true real bond, whereas a new TIPS is an attractive hybrid. This fact could explain the large jump down in the inferred real interest rate when the Treasury changed the raw bond data it uses. And it can explain why the issue became significant only recently, as people have started to seriously worry about deflation, inducing Treasury to change its calculations. One implication of this hypothesis is that the real interest rate now reported is not a true real interest rate but is infected by the hybrid nature of these bonds. Yields on older off-the-run bonds may be more meaningful. Of course, my conjecture could be completely wrong, as this is not my specific area of expertise. Another possibility is that the difference between these bonds instead has to do with changing liquidity premia. But one thing I am sure of: It is best to be wary of data from the TIPS market. As a student of Alan Blinder, Larry Summers, and Stanley Fischer, I was trained to view the short-run effects of fiscal policy through the lens of Keynesian macroeconomic theory. I am sure that many of the economists in the new Obama administration share that intellectual framework. After all, they are being drawn from my teachers (Larry Summers), my fellow students (Christina Romer), and my own students (Jason Furman). The Keynesian model has some clear, practical insights about how to think about fiscal policy during economic downturns. But are those insights true? One approach to answering this question is to examine the data using the techniques of time-series econometrics without imposing much a priori theory. For monetary policy, there is a large literature that does this; for fiscal policy, the literature is smaller but growing. The results from this exercise, however, do not always confirm the predictions from textbook Keynesian models. a deficit[-financed government] spending shock weakly stimulates the economy. government spending shocks crowd out both residential and non-residential investment without causing interest rates to rise. These finding are not consistent with standard Keynesian theory, according to which government spending multipliers are larger than tax multipliers and crowding out occurs through increases in interest rates. we find that both increases in taxes and increases in government spending have a strong negative effect on private investment spending. This effect is consistent with a neoclassical model with distortionary taxes, but more difficult to reconcile with Keynesian theory: while agnostic about the sign, Keynesian theory predicts opposite effects of tax and spending increases on private investment. This does not appear to be the case. Blanchard, incidentally, is now the chief economist at the IMF. I am not sure how convinced I am by these findings. And even if they are correct, I am not sure what model I should use to explain them and to what extent that model would apply to the extraordinary economic circumstances we now face. At the very least, these puzzles should give us reason to pause when using the Keynesian framework for policy analysis. There is still a lot about macroeconomics that remains deeply puzzling. Should we worry about government debt and future generations when devising fiscal policies to rescue the economy from it short-run troubles? In particular, should these concerns lead us to a smaller fiscal expansion than we might otherwise pursue? Some economists, such as Dean Baker and Paul Krugman, argue the answer is no. Worries about the budget deficit, in their view, should not deter fiscal expansion. In essence, they say that future generations would be even worse off if we live through a period of depressed aggregate demand, high unemployment, and consequently reduced investment. In my view, these arguments are cogent only under the maintained assumption that there is no good alternative to fiscal expansion. If our only choice is between (a) full employment with a large budget deficit and (b) depression without a large structural budget deficit, then by all means let's choose (a). But I continue to believe that there are other choices. Typically, these put monetary policy front and center. As I pointed out in an earlier post, based on data Paul put together, some measures of long-term real interest rates are still high. 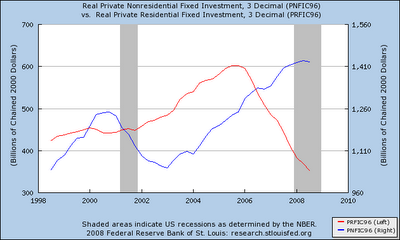 The Fed can work to get those down and expand private investment. To be sure, that requires nonstandard monetary actions by the Fed. At this point, simply focusing on the current target for the federal funds rate is not enough. The best thing to read about this topic is a speech Ben Bernanke gave in 2002. As I noted in my most recent Times column, the Fed is now engaging in the sort of creative monetary policy Ben talked about six years ago. One thing all economists agree on: If there are public investment projects that pay a high rate of return, those are worth paying for, even if it means more borrowing. But that is always true. Even if we were at full employment and there were no possible employment effects of fiscal stimulus, we should undertake public investments that pass a cost-benefit test. In this regard, two observations come to mind. First, since most infrastructure is used locally, the proper level of spending is best determined by state and local governments rather than by the federal government. Earlier, I suggested that fiscal stimulus could be decentralized. Each state governor could be allowed to determine whether to take federal money as state aid or have it paid directly to his or her state's citizens as tax relief. I still think that makes sense. Second, more public projects would pass a cost-benefit test if we repealed the Davis-Bacon Act. This law requires contractors on these public projects to pay "prevailing wages," which are typically union wages well in excess of what would occur in a free market. If the government paid market-determined wages for infrastructure projects, we could have both more infrastructure and less government debt. Without doubt, that legacy would benefit future generations. RIGA, Latvia -- Hammered by economic woe, this former Soviet republic recently took a novel step to contain the crisis. Its counterespionage agency busted an economist for being too downbeat.